Big Finish’s initial decision to commission a series of ongoing adventures featuring Henry Gordon Jago and Professor George Litefoot, two profoundly impactful characters who featured only once on screen in 1977’s ‘The Talons of Weng-Chiang,’ was a bold one fraught with risk. However, any concerns were soon put to rest as the series quickly became one of the most inspired and enjoyable in the company’s burgeoning library. On 16 July 2017, the world suffered a terrible loss with the passing of Trevor Baxter, and Big Finish quite rightly decided to retire the character following the incredible run of thirteen full series and several additional one-off adventures. With the gracious permission of Baxter’s estate and agent to allow usage of previously recorded material, however, Litefoot returns alongside a cavalcade of friends for one final goodbye in ‘Jago & Litefoot Forever’ by Paul Morris. Henry finds himself celebrating New Year’s Eve without his best friend for the first time in years, regaling those present with snippets of a tale stemming from the cliffhanger ending to the thirteenth series. Without dwelling too much on any specific details as Litefoot’s closest colleagues mount a search for him with only the most archaic clues to follow, Jago reveals that an alien menace had exerted a psychic influence over the local population and that Litefoot and he had been instrumental in bringing down the threat and offering a return to normality. Because of their heroism and dedication throughout their many adventures, they have been awarded knighthoods, but the time of the ceremony is fast approaching with Litefoot nowhere to be found. In a memorial story like this, it’s expected that the character in question will be featured in several flashback and memory sequences, but Morris deftly ties this into the very crux of the story itself as Jago finds himself slowly accepting and coming to terms with the fact that his memory is faltering. At the request of Dr Betterman, he understands that the best way to exercise his mind is to hold onto the strongest memories of the past and to take any action necessary to ensure that they are never forgotten. For Jago, no memories shine more fiercely than those spent with his dear friend investigating and righting wrongs, and he eagerly takes centre stage to once more relate some of his missing friend’s finest moments. Understanding the importance of the past, Ellie and Quick then accompany Jago to Carruthers Summerton’s Museum of Curiosities that acts like a shrine to the infernal investigators’ explotis, taking both the characters and the audience on a brief stroll down memory lane that exemplifies just how much this unlikely group has been through over the years. Jago’s sharp intuition suggests that it’s the world itself rather than his memory that is wrong, however, with the airship, this museum, and a very particular painting with ties to the series’s very beginning present in whole rather than broken and destroyed. With his own memories not the only ones seemingly failing, he begins to piece the strange goings-on together and determines that a very particular connection that Litefoot and he share that has been a source of comfort amidst this chaos of appearances and disappearances may just be the cause to blame. One hour is not nearly enough time to develop a truly weighty plot in a story such as this, but despite the relative simplicity of the introduction and resolution of this strange setting, Morris mines the setup for every bit of emotion possible, and Christopher Benjamin is absolutely mesmerising as he instills an incredible amount of humility to the usual pride and bombast of Jago throughout. Naturally, Jago and Litefoot are reunited for a glorious and celebratory finale in which they receive their due recognition and honours with each elevated to Knight Commander of the British Empire. Although Jago is a bit miffed that he will not be able to advertise his rank so as to maintain an air of anonymity in his continuing investigations, the celebratory sequence that sees Professor Dark, Leela, and Aubrey also return for brief cameos to pay their respects is a joy to behold, and the intercutting of Baxter’s recorded words from the past become more and more seamless until the inevitable end that comes far too soon. Indeed, the performances, direciton, and sound design all rise to the occasion specatcularly and capture the melancholy and the optimism that are balanced so well throughout. 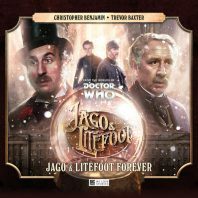 ‘Jago and Litefoot Forever’- while not the series finale Big Finish could have ever envisioned having to create- is a remarkably poignant and respectful testament to everything that has come before and the lasting legacy of one of the truly great personalities within the Doctor Who universe.